It’s the time of year when writers succumb to an inclination to categorize and rank. Everywhere I look, there are simplified ratings of complex people, new stories, and events; omnibus remembrances of the newly dead, and articles proclaiming the best of/worst of everything. Top ten lists abound. I, myself, can’t resist categorizing and ranking, and not only at year’s end. Throughout the year, my family sometimes plays a game that I like to call “Best & Worst.” At the end of a party, vacation, dinner, etc., one of us will ask another: “what was the best part of ____ and why?” And then, of course: “what was the worst part of ___ and why?” Round and round we go, discussing the highs and lows of the event, comparing judgments, agreeing and disagreeing until we’ve discussed things as well as we possibly can. If we play our game for the year that was 2009, I think we’ll have to get the “worst thing” out of the way first. There were all kinds of “worst” things about the past year: the crippled economy, petty politicians, childish celebrities, a lot of embarrassingly pointless news stories (balloon boy, anyone? ), and the painful, seemingly endless, healthcare reform debate, to name only a few. In fact, it might be difficult to pinpoint one particular day that was itself so terrible; let’s just say that the whole year was saturated by and enveloped in a bad, smelly fog of discontent. In spite of this, however, I can easily isolate one best day of 2009, one that was radiant in spite of all that fog. It was, without a doubt, the 20th of January. To celebrate the inauguration of Barack Obama, I canceled all of my classes and spent the day with Mimi and Jim, watching every second of the festivities on our computer screen (we don’t have a functioning television). I even decorated the outside of our house with American flags, something entirely out of character for me. For dinner — prepared just before coverage of the inaugural balls started — I served a meal inspired by the inaugural lunch, with a few additional nods to ingredients from geographically significant places in Obama’s life. 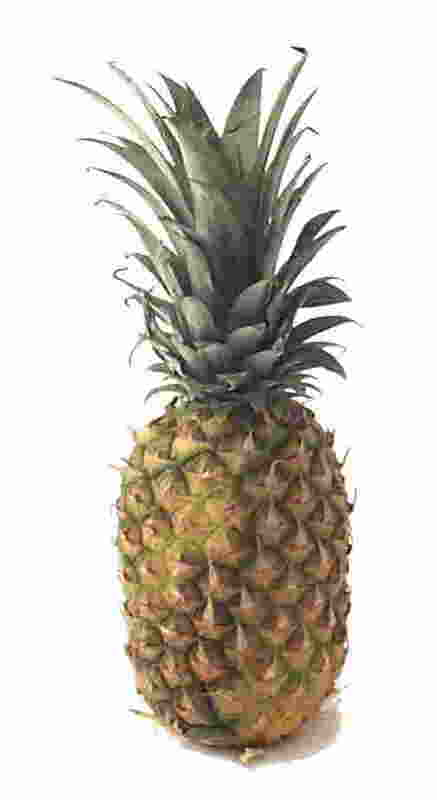 The star of the meal was ambrosia, made with fresh pineapple (from the great state of Hawaii), bananas, and coconut. sometimes the food, sometimes the drink, of the gods, often depicted as conferring ageless immortality upon whoever consumes it. It was brought to the gods in Olympus by doves (Odyssey xii.62), so may have been thought of in the Homeric tradition as a kind of divine exhalation of the Earth. I’m not suggesting anything actually divine about the inauguration of Barack Obama, but it did seem to me that on January 20, 2009, a lot of people who live on a small section of the Earth’s northern hemisphere were finally able to exhale — or sigh — in a way that felt divine, or very nearly so. Ambrosia was a fitting accompaniment to our inaugural meal. In the quite a few parts of the US, notably the South and Midwest, ambrosia is a much more prosaic dish than its classical name implies. Sometimes called “five cup salad,” a name that is surely the antithesis of the word “ambrosia,” this modern version almost always includes one full cup of–shivers!–miniature marshmallows as well as other ignoble ingredients like mayonnaise, maraschino cherries, and canned mandarin orange and pineapple. It would be difficult to convince a dove to carry such food anywhere. A more divine version of ambrosia includes fresh fruit and substitutes bananas for the marshmallows. And while our inaugural ambrosia salad did not, as far as as I can tell, confer ageless immortality upon anyone, it did make us all very happy. Combine the first four ingredients in a large crystal bowl. Sprinkle the coconut and pecans over the top. Serve immediately. This probably makes enough for four as a side dish. It also makes a great dessert — just add a bit of freshly whipped, lightly sweetened cream, maybe spiked with Grand Marnier. * To supreme a citrus fruit: With a serrated knife, cut the peel and pith from the top and bottom of the fruit so that it stands level on a cutting board. Beginning at the top of the fruit, carefully cut the peel and pitch away with long, even strokes. Next, pick up the fruit and hold it over a bowl to catch the juices. With your knife, locate the membranes that section off the fruits segments. Carefully slice the fruit in between the membranes to loosen. You wind up with lovely, peel, pith, membrane-free slices of orange, grapefruit, etc. It’s not hard to do and is absolutely worth the time and effort. **I’m not really sure what to do about the cherries. First, cherries aren’t in season in January. Second, I confess, I sort of like maraschino cherries. Still, that red dye is spooky, isn’t it? I’ll look for a jar of morello cherries for the future. You should do whatever seems right to you here. And one more thing: although this post implies otherwise, I actually like “Five Cup Salad,” miniature marshmallows and all. In fact, if I’d had the presence of mind to do so, I would have taken a photograph of the ambrosia salad that we had yesterday for Christmas dinner at my in-law’s. Still, I’m fairly sure that anything that contains miniature marshmallows cannot properly be considered classical “ambrosia,” and I definitely wanted something divine on January 20, 2009. Whenever I make a casserole, I always have a vague feeling that I’m cooking something that is hopelessly unfashionable. There’s no proof of this except that I don’t find many other food bloggers banging away at descriptions of luscious and indulgent casseroles. And, other than Deborah Madison, who seems to have a real affection for them, few print-based food writers pay them much attention either. There are good reasons for this, I suppose. Casseroles don’t photograph very well, a serious drawback in this visual age. They don’t demand any particular culinary skills, being closer to assembling than proper cooking. They don’t often showcase ingredients in their best lights. And then there are the negative associations. I hear the word “casserole” and immediately envision some grey-green, lumpy thing made from Stovetop Stuffing mix, Campbell’s cream of mushroom soup, and frozen spinach: something that I might have eaten back in 1982, maybe while listening to A Flock of Seagulls. And while that particular casserole had it charms (strange, but true), it isn’t something that I or very many other people want to cook in this more enlightened era. However, it is useful to have one or two recipes for casseroles in the culinary repertoire and this doesn’t mean that we have to reconcile ourselves to using matchstick onions or Velveeta cheese. One of my favorite casseroles features spaghetti squash, that most mysterious member of the squash family, topped with a simple tomato sauce. I’m not sure if using spaghetti squash renders this recipe utterly unfashionable or entirely cool. The point is that the resulting casserole tastes good, is easy to make, and is terribly nutritious. Besides, raking the squash into spaghetti-like strands fascinates small children and adults alike, something that is certainly cool. Preheat the oven to 375 degrees. Pierce the squash all around and place it into the hot oven on top of a rimmed cookie sheet. Cook for about one hour (or until the squash is fork-tender). Meanwhile, in a sauce pan, heat up 1 tbs. olive oil on medium high heat. Sauté the onions until just soft (about 5 minutes); add 2/3 of the minced garlic and stir for one additional minute; and the spices and sauté for one more minute, stirring constantly. Add the tomatoes, wine and water (if necessary). Simmer for 20-30 minutes. Adjust the seasonings; remove from heat and cool. When the squash is fork-tender, remove from the oven. Carefully slice the squash into two halves lengthwise. There is a lot of steam inside–be careful not to burn yourself. Allow to cook for a few minutes. Remove the seeds and pulp. Do not turn off the oven. Now the fun begins; rake the squash lengthwise with a fork. 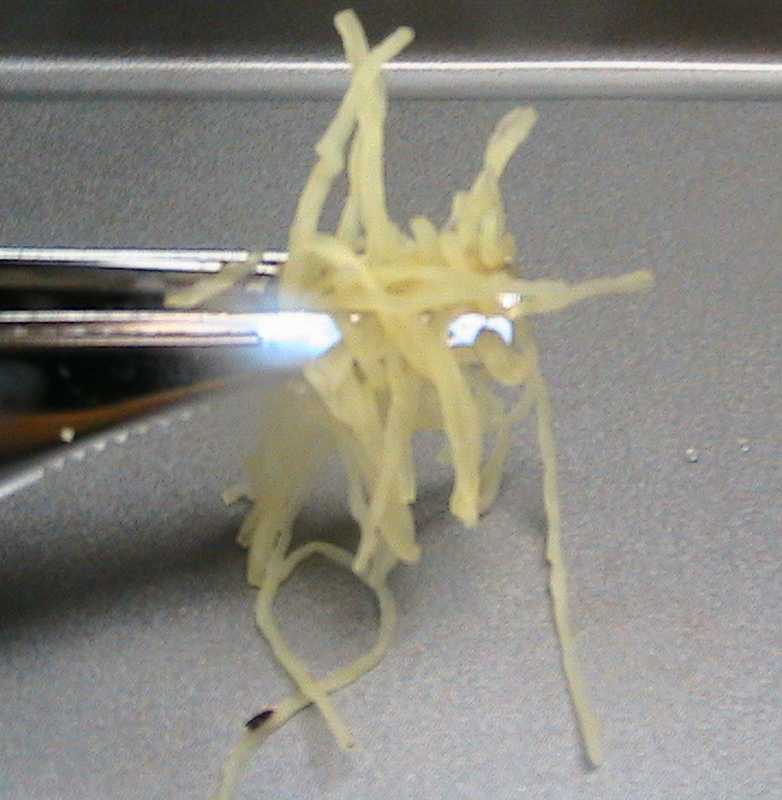 The strands should lift out of the spaghetti squash carcass fairly easily. Place forkfuls of them into a glass baking dish. I used a 9x7x2 dish made by Pyrex. Toss squash with remaining olive oil, garlic, olives, feta, and salt & pepper to taste. Top with the tomato sauce. Grate kasseri cheese over the top. Bake, covered with aluminum foil, for 30 minutes. Remove foil & continue baking for an additional 10-15 minutes, or until the casserole is nice and bubbly and the cheese is golden brown. Gel up your hair and enjoy.